Since entry of Android operating system in market, too much of craze of adroid phone, cause manufacturer of mobile companies to produce cheap android phone and which is one of the way to get ahead in competition for android world. Here an attempt is made to give some important details of each phone to get you clear idea which phone to buy and which not to. Here there is list of few cheap android phones available in Indian market. 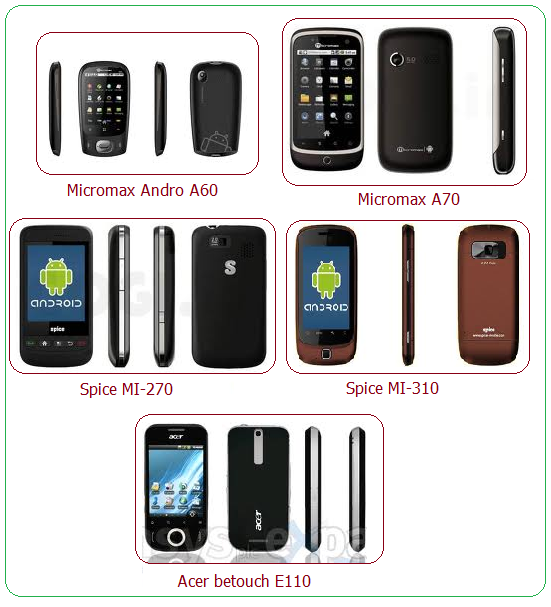 These phones include Micromax, Acer and Spice phones. These devices include very attractive features which also serve the need of the buyer/user. Now it is up to the person who want to buy these phones based on one's need and desire. Here I have concluded to buy Micromax A 70 because of its high features and specifications with latest technology and also the affordable price compared to other phones in the list. So, it is highly recommended to buy Micromax A70 if you are planning to buy one of the cheapest but high configured mobile phone with Android operating system. Look is great aspect of this phone. Nemo Player for music and video. In this article I have compared Micromax A116 Canvas HD with Samsung Galaxy Express, Zync Cloud Z5, iBall Andi 4.5h, Karbonn Smart A12 and Spice Mi-530 on the basis of technical specifications. Read this article and get a comparison on Micromax Canvas HD vs other top smartphones in India.